One point of confusion about wind turbines is the difference between a DOWN-WIND wind turbine generator and an UP-WIND wind turbine generator? An Upwind turbine faces into the wind with the turbine blades in front of the Nacelle* while a Downwind turbine has blades to the rear of the Nacelle and faces away from the wind. Up-wind turbines are by far and away the most common, but down-wind turbines (usually two-bladed) are also used in certain situations. In very strong winds the turbine blades of a wind turbine generator flex under enormous forces. With a down-wind turbine the blades flex AWAY from the mast which prevents them from crashing into it. Up-wind turbines need to be designed so that the blades are positioned at a good distance from the mast, and they must also be engineered to be inflexible (which costs more money). 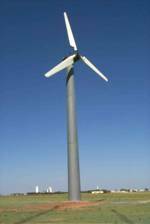 In addition, when the blades of a down-wind turbine bend it reduces the stresses on the mast as wind energy is lost in bending the blades. Finally, down-wind turbines do not need a tail (or motorised yaw mechanism) to align them with wind as the turbine blades perform this task (although this can also be a serious disadvantage in large down-wind turbines if wires carrying huge currents are getting twisted). Down-wind turbines on the other hand are generally noisier (additional aerodynamic noise), and the blades are subject to more forces than those of up-wind turbines. Another serious disadvantage of a down-wind turbine is wind shadow behind the mast causing a drop in power each time a blade passed behind the mast. *Nacelle = is located at the top of the mast and contains the rotor and generator, and sometimes a gearbox. Basically it is everything except the turbine blades, tail, and mast.